If you loved the Fiat 500’s retro cool looks, the Fiat 500L Hatchback is essentially the same car – but bigger. Think of it as the practical version of the popular city car. This means it’s got the cute-as-button looks and low running costs, but with added space and versatility. In some ways, Fiat can’t lose with this car. It’s derived from a smash-hit city car, while the Mini MPV sector is booming. This is a good addition. We like the clever seating arrangement and sizeable boot, as well as its ability to bob in and out of traffic. It’s so easy to park, too. OSV takes a closer look at what it’s all about with our 2017 Fiat 500L Hatchback review. The engines are all fine, but where the 500L comes in for some criticism is its drivability. It’s just not quite as entertaining as the Fiat 500 Hatchback. Part of the reason for this is that its driving dynamics are taken from the Fiat Punto. A car that is not exactly known for its class-leading handling! The steering is overly light and doesn’t really offer any feel. This can undermine your confidence, as it’s hard to judge where you’re planting the car. Moreover, while there is a grip on offer, it’s never easy to work out how much exactly. As such, we wouldn’t recommend that you approach corners with enthusiasm. Body lean is excessive, too, while the driving position is high. In fact, it’s so high that we’re wondering if Fiat were caught between two minds – did they want an MPV or an SUV? However, it’s a fairly nippy car that can leave city traffic trailing thanks to its size. You can squeeze in and out of tight spots with ease. In terms of the engines, a 1.4-litre T-Jet petrol unit offers decent straight-line performance. It can do 0-62 in 10.0 seconds but feels faster. There is also the option of a 0.9-litre TwinAir petrol engine, but it takes 12.0 seconds to do 0-62. That might be too slow for some of you, but it has bags of character. The diesels have more, though, and arguably suit this car better. OSV has taken a shine to the 1.6-lite diesel engine the most. It’s got enough mid-range power to cope with a fully-loaded 500L, and can do 0-62 in 11.0 seconds. Hardly jet-heeled stuff, but it should be enough for most buyers. This is a family car, and it offers as much comfort as you would want. The suspension absorbs errant lumps and bumps in the road, though the range-topping model gets stiffer springs. The cabin is poorly insulated, though, and you might get annoyed by the amount of exterior noise that creeps in. This is especially the case on the motorway, where the wind can reach a really annoying crescendo! The interior is lovingly designed, and looks and feels stylishly retro. However, Fiat has put less love into the materials used, and some of the plastics are of questionable quality. The driver’s seat is height-adjustable, while the steering wheel is both reach and height-adjustable. This means it’s easy to get into your favourite position. 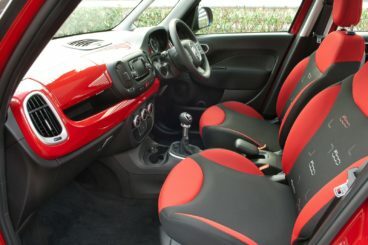 The 500L also offers a higher driving position than the 500, which means visibility is excellent. The interior is bigger than the 500’s, which means passenger have more space to stretch out. And with 1,500 seating combinations, the car is super versatile. You can turn the passenger seat into a picnic table by folding it forward, which is a clever touch. The reach bench, meanwhile, slides backwards and forwards for more room. The boot has grown massively. Whereas the 500 Hatchback offers only 185-litres of space, this car offers 400. That’s, even more, luggage space than the VW Golf offers. You can increase luggage space by sliding the rear seats forward, while its floor can be lowered or raised. Standard kit is one of this cars strengths. The entry-level model gets a 5” touchscreen, remote central locking and an adjustable boot floor. Front electric windows are also included. We prefer the Pop Star trim. It adds chrome door trim and 16” alloys, and looks a lot smarter. The Lounge models take things up another notch with a cool SkyDome sunroof and rear electric windows. It also gets a neat climate control system that offers the passenger and driver two separate controls for the temperature. The Trekking is your model of choice if you want a decent off-roader. It’s got a raised right height, bulkier bumpers, mud tyres and a better traction control system. In terms of safety, the car scored 5/5 when crash tested by Euro NCAP. Its standard safety kit includes anti-lock brakes, side airbags, electronic stability control, and traction control. Prices for the new car start out from just over £16,000 and rise to £21,300. For more information on our lease deals, you can check out our page here. In terms of its running costs, the car is budget friendly. However, some of the numbers from Fiat are deceptive. For example, they claim their 0.9-litre TwinAir engine is good for fuel economy returns of 58.9mpg. The reality is more like 40mpg. We can’t argue with the £30 a year tax bill, though – that’s correct. The diesel engines are your best bets if running costs are a priority. The 1.3-litre diesel is good for 70.6mpg, and the 1.6-litre 104bhp is good for 62.8mpg. The bigger 118bhp variant is even cheaper, and returns 67.3mpg. It’s got a much bigger body than the standard 500, which means more leg and headroom. You also get a 400-litre boot and a very flexible seating arrangement. The 0.9-litre petrol engine aside, the diesels are cheap to keep on the road. The 1.3-litre is the most frugal, and can return over 70mpg. On the second-hand market, the car doesn’t do well. 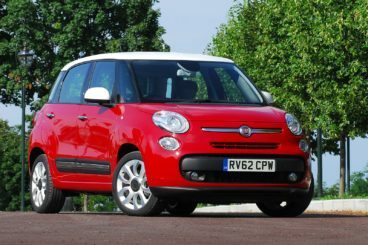 Especially when compared to the desirable 500 Hatchback, the 500L depreciates badly. After 3 years of ownership, we don’t expect it to be worth more than 30% of its original value. Its driving dynamics are based on the Fiat Punto. Enough said! The 500L doesn’t quite replicate the 500’s chirpy city car characteristics. Let’s see how the car fares against its rivals in the comparison section of our 2017 Fiat 500L Hatchback review. The new MINI Clubman is an unconventionally styled Estate car that’s a bit of a left-field alternative to the Fiat 500L. MINI’s have been putting smiles on peoples’ faces since they were brought in from the cold in 2001 by BMW. This Clubman is also capable of putting a smile on your face with its lively performance and sharp handling. It’s nippy and eager, and comes with a soft suspension which ensures a comfy ride. And if you want four-wheel-drive, the ALL4 version is worth looking at. In term of the engines, the Cooper S 189bhp petrol model will prove to be the most popular with keener drivers. It can do 0-62 in almost 7.0 seconds, before maxing out at 142mph. It’s enjoyable to drive, and doesn’t have to be too expensive if you avoid the All4 option. 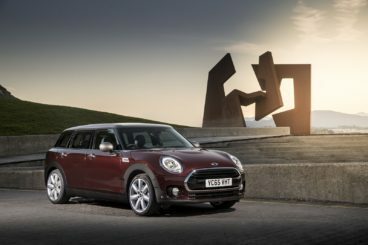 Other engines in the range include a rapid 1.5-litre 136bhp petrol engine, and the Cooper D. This is a diesel model that’s the bestselling Clubman to date. It’s powered by a turbo diesel 2.0-litre power plant that accelerates strongly, and can do 0-62 in 8.6 seconds. But perhaps the real reason it’s so popular with buyers is its low running costs. Capable of returning fuel economy of 68.9mpg and emitting 109g/km of CO2, it’s cheap and green-minded. The Cooper SD is a better option if you want a bit more performance, though. It returns fuel economy of 65.7mpg, and emits 119g/km of CO2 at the most. MINI tends not to do things by halves when it comes to their interiors, and the Clubman is no different. The exterior is quirky, and so is the interior. But despite the quirks and the brand’s desire to stand out, the car’s cabin is still usable and well laid-out. There are also lots of cool stuff in here, including an infotainment system and a sat nav that’s displayed on a large dial in the centre console. The cabin also gets air conditioning as standard. MINI has also toned things down a bit from last time around, so that the car is more practical. Previously, practicality was something the Clubman struggle with. In 2017, it’s more of a conventional estate, which means interior space is good. The wheelbase has been stretched, so legroom is improved. Storage space is also better, and the glove box can now hold a 1-litre drinks bottle. Like last time, you access the boot via twin barn doors. This is unconventional, and it can be a source of frustration. If it’s too annoying, you can request a system that lets you open these doors automatically by waving your foot. The boot itself measures 360-litres, which is smaller than the Fiat’s. The new Citroen C4 Cactus is even more distinctive than the MINI. Indeed, its daring styling makes the MINI Clubman look positively bland. 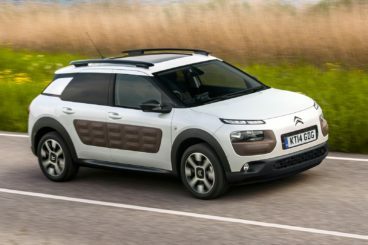 On the road, Citroen wanted their C4 Cactus to be comfortable – and that’s what they’ve got. Even if you go for a higher-spec model with big wheels, you’ll still get smooth ride quality. This is also thanks to the sheer lightness of the car. In essence, the C4 Cactus is a cruiser. It does roll a bit in bends, but it’s hardly an issue. Moreover, you expect a bit of roll when the suspension is so cosseted. All the engines in the range are capable of pulling this rather hefty Estate car along without any hassle. The smallest diesel gets a bit cranky when you push it too hard, and we prefer the characterful petrols. But even the BlueHDi 100 can do 0-62 in 10.6 seconds. It overtakes with confidence, and only the PureTech 110 petrol engine is quicker. This does 0-62 in 9.3 seconds, and doesn’t require much effort. The small PureTech 82 is ideal if you really want a petrol but want to keep costs down. It’s free to tax, and returns fuel economy of 65.7mpg. No petrol engine is what you’d call expensive to keep on the road, though. None cost more than £20 a year to tax, and even the bigger 108bhp returns 60mpg. The diesels are really frugal, though. According to Citroen, if you pair a BlueHDi diesel engine with 15” alloys, you can return 90mpg. The flamboyant exterior of the car hints at an equally stylish interior. And that’s what you get. Sure, some of the plastics feel a bit hard and cheap. But we reckon people will be too dazzled by the fashionable cabin to worry too much about that. The pop-out windows might be evidence of cost-cutting gone crazy for some of you, though. However, you really don’t get style like this too often in this sector. Citroen has gone for a simple, slick design that’s bold in its conception and execution. You can customise your dashboard so that you get the right colour. A 7” colour display reduces button clutter, and standard kit includes a DAB radio and electric windows. This is a practical car, too. There is oodles of interior space, and its front seats are almost like arm chairs. So easy to get comfortable in. The steering wheel can’t adjust for reach, but that’s our only criticism. The boot measures 358-litres, and can extend to 1,170 by folding the rear seats. Storage spaces are plentiful thanks to Citroen’s bright idea of moving the airbag to the roof. Two adults can sit in comfort in the rear, and AirBump side protection is standard. City car lovers fell in love with the Fiat 500. But this isn’t a city car, and a stumbling block for some buyers might be its cute and smiley looks. That and cheap-to-run engines are all that Fiat have transferred over to this larger hatchback, though. This car has a much bigger boot than the standard 500, more interior space and more usability. The Fiat 500L Hatchback, however, lacks a keen sense of fun, but does a job for families on a budget.